Bryant Park is in midtown Manhattan, bordered by 5th and 6th Avenues and 40th and 42nd Streets. I came across it when I was walking one lunchtime looking for somewhere to stop. Things were still damp from an earlier rain shower. I reached the park at about 1.15pm and found a seat near a singing House Finch. As I ate my lunch I noticed a bird with a distinct silhouette causing me to quickly eat the rest of my lunch so I could investigate. I didn't have binoculars with me but fortunately didn't seem to need them. 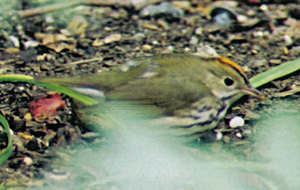 My distinctive bird turned out to be an Ovenbird. 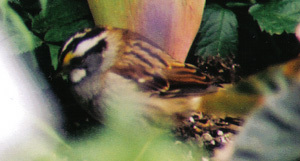 As I walked around the park looking into the shrubby borders I found a few White-throated Sparrows, a Gray Catbird and a Wood Thrush. 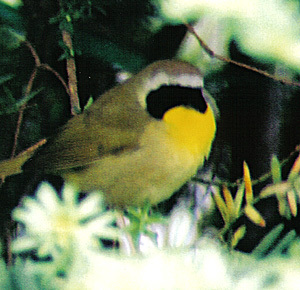 I also heard Common Yellowthroat. Time ran out so I headed back to work. I did go via the hotel to alert Helen about what I'd seen. That evening, about 5.50pm, Helen and I went back to Bryant Park to see what was about. The earlier rain had definitely had an effect and we soon has very close views of several Ovenbirds on and beside the path. This time we had binoculars and could check the trees. We found two Common Yellowthroats then, as we walked around, a male Black-throated Blue Warbler, a Black-and-white Warbler, a female Scarlet Tanager, two male Magnolia Warblers, a Yellow-rumped Warbler and a female Bay-breasted Warbler! Serious stuff. The White-throated Sparrows were again in the bushes and we had brief views of a Hermit Thrush and another Gray Catbird. The next day was Saturday and we intended to visit Central Park. Hopefully some of this fall would still be around. Around lunchtime on our last day in New York we again visited Bryant Park. There were still some birds here, but, as with Central Park, things were much quieter. We did see three Ovenbirds, one often out on the path but unapproachable, at least three White-throated Sparrows, one Gray Catbird and a singing Yellow Warbler. Common Yellowthroat could again be heard now and then and one briefly came down to the shrubs and moved through past us. I managed to get a quick photograph of it as it appeared in a gap in a bush.